Douglas Everett grew up in the San Francisco Bay Area near the hills of the east bay in apricot and cherry orchards. A mile away, oddly, from where in 1915 Charlie Chaplin filmed The Tramp. For eight summers he worked in tomato canneries achieving the coveted position of chief condiment clerk.. Doug later received a BS degree in Biological Sciences from UC Davis; and an MD from UC Irvine. For 24 years he has been a practicing physician in the Central Valley. In spare time he enjoys bicycling, kayaking and flying. 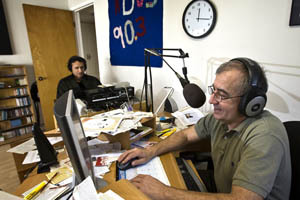 Since 2000 he has been doing radio programs - first for community radio, then for KVDS. He contributes to local NPR affiliate; Capital Public Radio. He spent much of 1988 traveling and has visited 77 countries. He tries to go when total eclipses happen. Such ventures included Baja in '91, Bolivia in '94, Turkey in '99, and Siberia in 2008. He's 4 for 4 in the solar eclipse department. Doug notes that he's knocked off many of his "bucket list" items: trekking near Everest, camping in Kauai, riding elephants in Thailand, rafting the Zambesi, swimming the Golden Gate, doing the Alcatraz triathlon, climbing Mt Chimborazo, hang gliding in Rio, locating a treasure, hiking the Inca trail, and explaining evolution to San Joaquin Valley evangelical Christians so even they understand it. He lives in Sacramento with three cats.